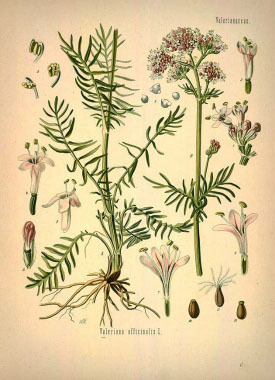 Valerian is most recognized for helping to ease insomnia, anxiety, and nervous restlessness. It became popular in Europe in the 17th century. In addition to being medicinal this is also edible. 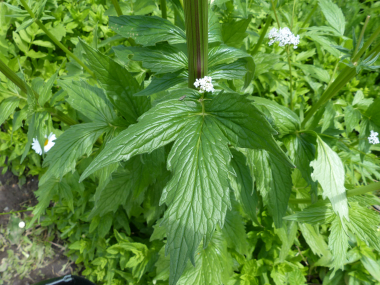 This plant was in the Valerianaceae family but is now in the Caprifoliacaeae family. When dried, this plant smells horrible. Distinguishing Features: Valerian is a perennial plant that is native to Europe and grows (on average) up to 1 metre (3’) tall. Although it is a garden plant, it also grows wild in damp grasslands. 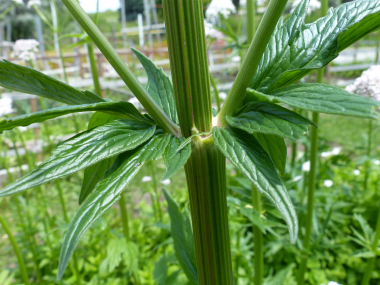 Straight, hollow stems are topped by umbrella-like heads. Its dark green leaves are pointed at the tip and hairy underneath. Small, sweet-smelling white, light purple or pink flowers bloom in June. Flowers: Flowers are in branched clusters of small white to pink blossoms and measure 2.5 to 5mm (.1 to .2”) long. The corolla is slightly unequal. The calyx is small and collar-like. It has three stamens. Flowers are fragrant. Flowers bloom in June and July. 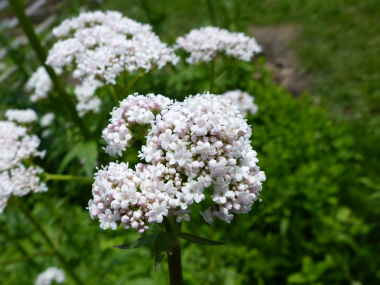 Fields of Nutrition has medicinal benefits and vitamin/mineral content of Valerian. Leaves: Leaves grow opposite and stalked. The blade is pinnate with 6-11 pairs of terminal leaflet. Leaflets have toothed margins and the terminal leaflet is not really broader than the lateral leaflets. 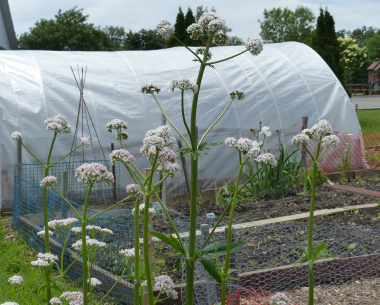 Height: Depending on location and soil conditions valerian can grow anywhere from 80cm (32”) to almost 2 metres (6’) in height. Habitat: Valerian grows in fallow fields, abandoned areas, forest edges, river banks, and in shore meadows. Edible parts: The seeds are edible and the leaves have been used in the past as a condiment. Leaves can be used to make a tea as well as the root. Be sure to use in moderation.